Disclosure: This post contains an affiliate link, which means I receive a small commission if you make a purchase using the link above. If you have been following my blog since the beginning you have noticed that my very first book review was by Debbie Dee (see post here) after reading that book I wanted to read her other books. She has written two others. The best part about the other two books are they are part of a trilogy. So I read the first book of the Incenaga Trilogy and reviewed it last month (see post here). I love trilogies because they don't have to end after the first book. 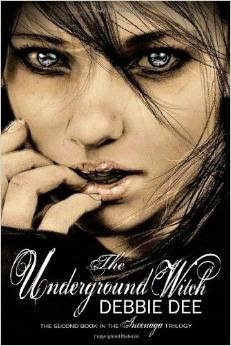 I am going to do this month's review on the second book of the trilogy called, The Underground Witch. I am anxiously awaiting the third and final book! Let's dive into this book. This book picks up from the point that book one left off. Emmeline and Erick are about to get married and then their love is put to an ultimate test. This book explained a lot about the Incenaga witches and the history of them. I had a lot of questions while reading the first book that the second book answered. So my curious mind was able to rest for a bit. With that said, the suspense for me was more intense in this book. So my mind could take ease, but there were times my heart was pounding. It's weird because it was a slower read for me. However, I was wondering with every turn of the page what would come next. There were many new characters added in this book. There is a new evil introduced and his name is Tiergan. He is a little naive when it comes to Emmeline and her powers. He is very cruel and evil. He started off trying to get Emmeline to use her powers by being nice to her and treating her very well, but when that did not work he threw her into a pit to think and hopefully coerce her to use her powers for his gain. Demyan is his assassin and he gave me the creeps the whole book. He has unnatural strength and I am not going to say anymore because I do not want to give anything away. Orida is one of the characters that I think we will see a lot more of in the next book. I cannot tell you more about her because it will give too much away. O'fin is the character in this book that I fell in love with. He is so young, but yet so brave. He makes me happy and Emmeline adores him too. Emmeline did not change much. Again she is the perfect heroine by putting other's first. I would recommend this book. I loved it. I just do not love waiting for the last book. Patience is not MY virtue. I really try, but I am quite impatient. I cannot wait to read it. When I find out a realease date I will tell you right away. In the mean time pick up your copy of the first two books! They are so good!